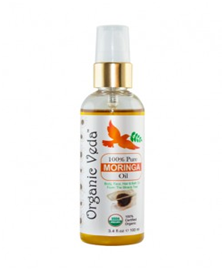 Moringa Oil is a somewhat new entrant into the world of beauty and skin care. The miracle tree has proven its worth in almost every aspect of medicine and health science and now, the superbly smart scientists and researchers have extracted the goodness of Moringa in the oil form. That’s right! You can now let your skin and hair take in all the amazing nutrients that this tree has to offer through the regular use of Moringa oil! Moringa Oil’s high vitamin and anti-oxidant content make it the perfect night serum that you can apply on your skin daily to prevent the signs of ageing from showing up on your skin. It also helps in smoothening in fine lines and prevents wrinkles from showing up while keeping the skin hydrated all year round. Moringa Oil is also an amazing hair straightening and nourishing product, especially for fragile and frizzy hair. It helps in curbing issues like split ends and frizzes and can treat hair damage, thereby ensuring that hair remain weight down and manageable, irrespective of the season. It is also amazing as body oil, providing the necessary nutrients and moisture for the skin on your entire body - especially during winters when dryness becomes one of the most challenging beauty issues for people. Moringa, in the form of oil, has emerged as an amazing gift to mankind. Make it a part of your daily skin and hair care regimen and bask in the glory of nature’s healing and beautification. You will simply love the new YOU, brought out by the goodness that comes with Moringa.